"A take on a traditional Caprese, but modified into a light summer pasta salad that goes great with anything off the grill, or just on its own. When I eat it on its own, I sometimes add about a cup of any chunked, cold sausage (I suggest pepperoni or a lighter summer sausage). Any pasta is fine, but I like the orzo's size. " Fill a large pot with lightly salted water and bring to a rolling boil over high heat. Stir in the orzo, and return to a boil. Cook the pasta uncovered, stirring occasionally, until cooked through, but still firm to the bite, about 10 minutes. Drain well, and let cool. Mix the mozzarella cheese cubes, tomatoes, basil, crushed red pepper flakes, and salt with olive oil in a salad bowl. 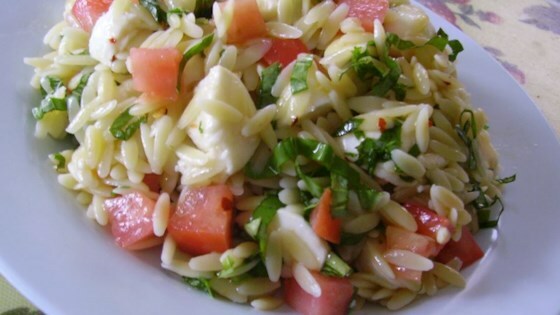 Gently mix in the orzo pasta, and toss lightly to coat the ingredients with oil. We all liked this salad, but like others, thought it needed something more. Next time I'm going to try adding some lemon juice and some minced garlic. MMM...this is one of my favorite recipes! We take it to all of our summer events. Yum, yum. Add pine nuts for a little twist. Made with penne pasta, wonderful simple & easy!